The bonds to be issued on the basis of the Programme are placed to institutional investors. The currently outstanding bonds issued by A2A Group account for about 2.6 € bn. It should be noted that Euro Bonds 2027, 2025, 2022, 2021 and 2019 and Private Placement 2023 and 2024 were issued under the EMTN Programme and that the current bond rating – where applicable, is different from the issue rating and is equal to the M/L term rating assigned to the Company by S&P and Moody’s. The bonds of the A2A Group are listed below. On 11 October 2017, A2A has successfully launched the issue of a ten-year bond for a total amount of 300 million euro, exclusively targeted at institutional investors under its Euro Medium Term Notes Programme. The notes have an annual coupon of 1.625% and were placed at an issue price equal to 98.700%, with a spread of 87 basis points over the reference mid-swap rate. The bonds, governed by English law, and listed on the regulated market of the Luxembourg Stock Exchange as of October 19, 2017. 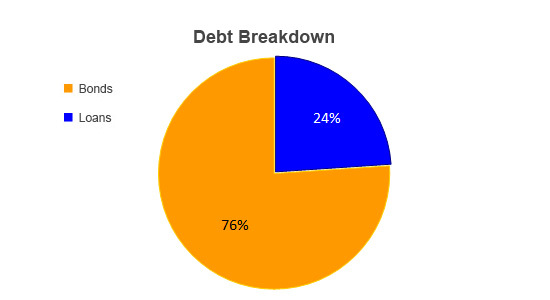 The issue will reduce the average cost of debt and, in line with the Group’s financial strategy, will increase the average maturity of debt and optimize the maturity profile. The placement of the new notes was arranged by Citi Group Markets Limited, Goldman Sachs International, Mediobanca – Banca di Credito Finanziario S.p.A., Société Générale e UniCredit Bank AG. The Company was assisted by the legal advisor Legance – Avvocati Associati. On 18 February 2015, A2A has successfully launched the issue of a ten-year bond for a total amount of 300 million euro, under its Euro Medium Term Notes Programme, which update and increase to a total of 4 billion euro has been approved by the Board of Directors on November 6, 2014. The notes have an annual coupon of 1.75%, A2A’s lowest coupon ever, and were placed at an issue price equal to 99.221%, with a spread of 110 basis points over the reference mid-swap rate. The bonds are exclusively targeted at institutional investors, governed by English law, and listed on the regulated market of the Luxembourg Stock Exchange as of February 25, 2015. 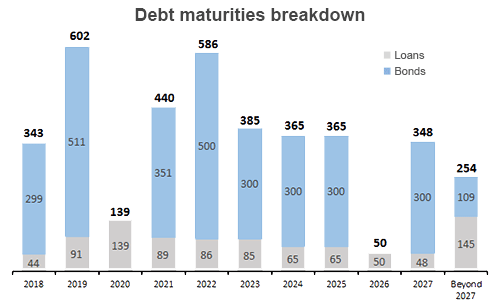 The issue – intended for debt repayment – will reduce the average cost of debt and, in line with the Group’s financial strategy, will increase the average maturity of debt and optimize the maturity profile. The placement of the new notes was arranged by Banca IMI, Barclays, BNP Paribas and UniCredit as Joint Bookrunner. On 9 March 2017 A2A successfully privately placed with a limited number of qualified investors Euro 300 million notes with a seven-year maturity due in March 2024, issued under its Euro Medium Term Notes Programme. The notes, governed by English law, have the following characteristics: a 1.25% annual fixed coupon rate; a 99.774% issue price and a 1.284% yield. The issue of the notes is in line with the Group’s financial strategy, aimed at extending the average maturity of the Company’s debt and optimizing the management of maturities. The placement of the notes has been managed by Morgan Stanley & Co. International plc. The notes are listed on the regulated market of the Luxembourg Stock Exchange as of 16 March 2017. On December 2, 2013 A2A has successfully privately placed a 300 million Euro tenyear bond under its 3 billion Euro Medium Term Notes Programme approved and increased by the Management Board of A2A on November 7, 2013. The private placement is in line with the Group’s financial strategy, aimed at extending the average maturity of the Company’s debt stock and optimizing the maturity schedule. Proceeds will be used to reimburse the debt close to maturity. The notes – with a minimum denomination of 100 thousand Euro, and maturity on December 4, 2023 – have a 4.000% annual coupon rate, and reoffer price of 99.539%. The re-offer yield is 4.057%, corresponding to 210 basis points over the underlying interest rate swap. The notes are governed by English law. The settlement date is December 4, 2013, when the notes will be listed on the Luxembourg Stock Exchange. On December 9 2013, A2A has successfully placed on the European market a 500 million Euro bond due on January 13, 2022, under its 3 billion Euro Medium Term Notes Programme updated and increased on November 25, 2013. The issue was exclusively targeted to institutional investors. The notes – with a minimum denomination of 100 thousand Euro – have a 3.625% annual coupon rate, and reoffer price of 99.561%. 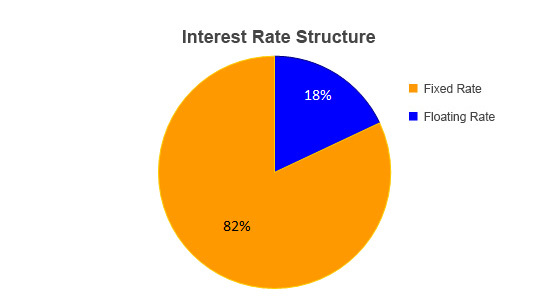 The re-offer yield is 3.688%, corresponding to 190 basis points over the underlying interest rate swap. 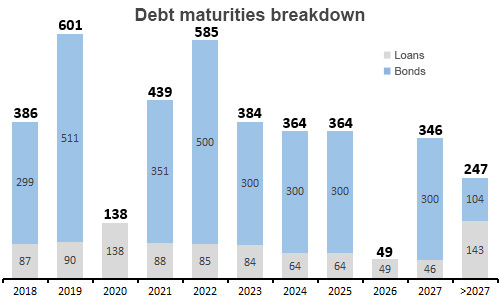 The issue – whose proceeds will be used for debt repayment – will allow to reduce the average interest rate on the Group’s debt and, in line with its financial strategy, extend the average maturity of the Company’s debt and optimizing the maturity schedule. The notes are governed by English law. The settlement date is December 13, 2013, and following that date the notes will be traded on the Luxembourg Stock Exchange. The placement of the notes was managed by Banca IMI, Credit Agricole, Mediobanca, and UniCredit, as Joint Bookrunners. On 2 July 2013 A2A issued a bond that was placed on the international Eurobond market and listed on the Luxembourg bond market. The seven and half year bond has a nominal value of EUR 500 million and pays an annual fixed-rate coupon of 4.375%. The bond has been issued under A2A's 2 billion Euro Medium Term Notes Programme and was approved by the Management Board on 12 February 2013. The placement of the notes has been managed by BNP Paribas, Banco Bilbao Vizcaya Argentaria, Deutsche Bank and Société Générale CIB as Active Joint Bookrunners as well as Banca IMI, Mediobanca and UniCredit Bank as Passive Joint Bookrunners. The bond ratings are the same as A2A ratings at the issue date. The net proceeds of the issue has been mainly utilized to repay in advance a portion of A2A existing bonds: 500 M€ due 2014 and 1,000 M€ due 2016. On 23 November 2012 A2A issued a bond that was placed on the international Eurobond market and listed on the Luxembourg bond market. The seven-year bond has a nominal value of EUR 750 million and pays an annual fixed-rate coupon of 4.5%. The bond has been issued under A2A's 2 billion Euro Medium Term Notes Programme and was approved by the Management Board on 15 November 2012. The placement of the notes has been managed by Banca IMI, BNP Paribas, Mediobanca and UniCredit Bank, as active Joint Bookrunners, as well as Banca Akros – Gruppo BPM and Centrobanca as passive Joint Bookrunners. On 28 November 2013 LGH issued a bond that was placed on the international Eurobond market and listed on the Luxembourg bond market. The issue has a nominal value of EUR 300 million and a five-year maturity. It pays an annual fixed-rate coupon of 3.875% and provides a Change of Control Put in the event of a change of control of the company. Following the acquisition by A2A S.p.A., this option was exercised by some bondholders for a total amount of 500 thousand euro, reimbursed on October 12, 2016. The placement of the notes has been managed by Banca IMI and Unicredit Bank. On 10 August 2006, ASM issued its second bond. It was not, however, placed on the market but wholly acquired by Aflac , one of the biggest US insurance groups and the largest in Japan. The bond has a 30-year maturity with a half-yearly coupon; it is worth a total of around EUR 95 million and carries an annual fixed coupon of around 5.4%. The loan, which was initially issued in yen (14 billion) with a yen fixed rate (3.2%), was converted into a euro-denominated bond via a cross currency swap. On 27 October 2009 A2A issued a bond that was placed on the international Eurobond market and listed on the Luxembourg bond market. The seven-year bond has a nominal value of EUR 1 billion and pays an annual fixed-rate coupon of 4.5%. On 28 May 2004, ASM issued a bond that was listed on the Luxembourg market. On 17 October 2003 AEM issued a bond that was placed on the international Eurobond market and listed on the Luxembourg bond market. The ten-year bond has a nominal value of EUR 500 million and pays an annual fixed-rate coupon of 4.87%. The placement was handled by investment banks JP Morgan, Mediobanca e Unicredit Banca Mobiliare. Standard & Poors awarded a credit rating of BBB to the issue, the same rating as that given to the issuer, AEM. The view of rating agencies on A2A debt. A2A S.p.A. loan with BEI: expiring in November 2023, residual balance at December 31, 2017 amounting to 114.3 million euro, at floating rate interest. Collar to fully cover the loan and the same maturity, with a floor on Euribor rate 2.99% and 4.65% cap. At December 31, 2017, the fair value was negative for 10.6 million euro. The loan is measured at amortized cost. 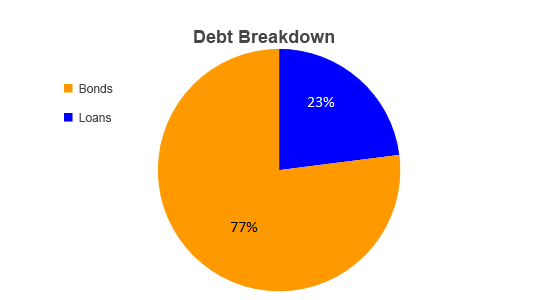 The collar is a cash flow hedge, with 100% recognized in a specific equity reserve. Linea Energia loan with Unicredit: maturity May 2021, residual balance at December 31, 2017 amounting to 17.7 million euro, at floating rate. 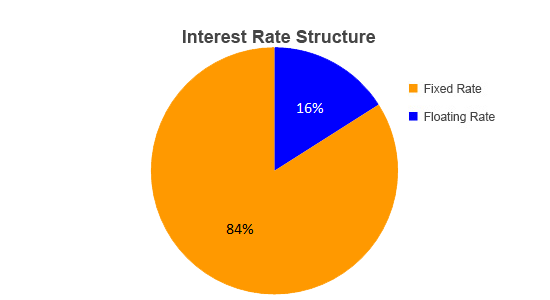 IRS on 100% of the amount of the loan until maturity thereof. At December 31, 2017, the fair value was negative for 0.7 million euro The loan is measured at amortized cost. The IRS is a cash flow hedge, with 100% recognized in a specific equity reserve. 11 Leases of A2A Rinnovabili with various credit institutions and maturities, total debt at December 31, 2017 of 27.5 million euro, at variable rate. IRS on 88% of the lease amount. At December 31, 2017, the fair value was negative for 4.1 million euro. The IRS are in cash flow hedge, with 100% recognized in a specific equity reserve. In order to analyze and manage the risks relating to interest rate risk the Group has developed an internal model enabling the exposure to this risk to be calculated using the Montecarlo method, assessing the effect that fluctuations in interest rates may have on future cash flows. Under this methodology at least ten thousand scenarios are simulated for each key variable on the basis of the associated volatilities and correlations, using market rate forward curves for future levels. In this way, a probability distribution of the results is obtained from which the worst case scenario and best case scenario can be extrapolated using a 99% confidence level. More details are available in the 2017 Consolidated Financial Statement, under Risk Management section.